The Japanese company, Toho Co, LTD, (responsible for the first monstrosity),has decided to acquiesce to the public demand for more Godzilla! More Godzilla! I mean it was only 2014 when Gareth Edwards directed the last Godzilla pic and it won’t be 2018 until his sequel hits theaters, so writer/director Hideaki Anno has stepped up to fill the void for a project that will hit theaters in Japan in July of 2016. Toho has released the first teaser trailer for ‘Godzilla: Resurgence‘, before you check out the trailer, be aware that this Godzilla does not exist in the same universe as Edwards‘ movies do, but any fan, worth their salt wants to watch Godzilla in any form. Being a Japanese production, of a Japanese property for Japanese release should make it easy to realize that the trailer will be all in Japanese, I mean a roar is a roar is a roar, right? Toho began the legendary series in 1954, and the reboots have been limitless, since then. With ‘Zilla appearing in over 31 films in all. What’s awesome about this film is “The time has come for Japan to make a film that will not lose to Hollywood” said producer Taichi Ueda. I’m ready to see a giant monster stomp an unsuspecting city and all those included and it may be more interesting now that the film will employ special “hybrid” effects techniques to create the monster. There’s not a lot of Godzilla showing up in the teaser, but it’s definitely going to make us ready for the next taste of Godzilla. 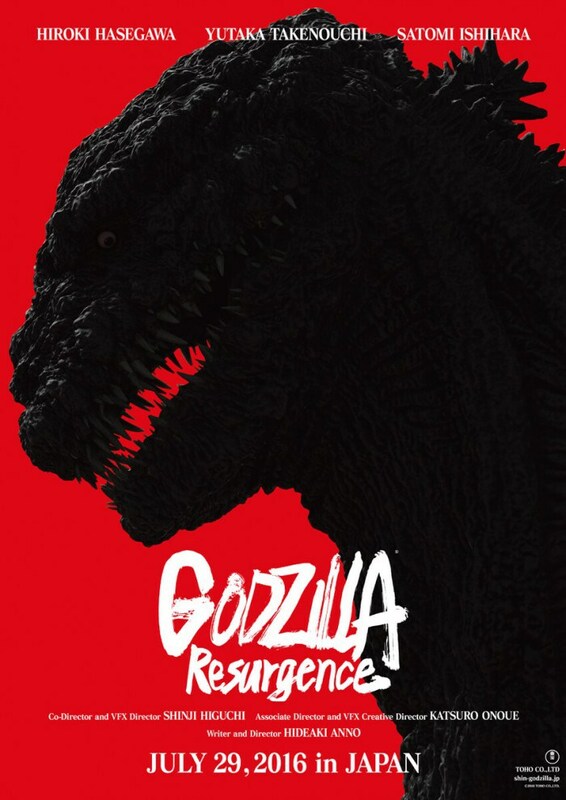 ‘Godzilla: Resurgence‘ opens July 29, 2016 in Japan, we don’t have a U.S. date announced, yet. This entry was posted on Friday, December 11th, 2015 at 2:43 pm	and is filed under Film, News. You can follow any responses to this entry through the RSS 2.0 feed. You can skip to the end and leave a response. Pinging is currently not allowed. « Ron Howard Has News About ‘Arrested Development’ Season 5!! !